Following the recent updates about the DRAM (in the log DRAM (again)), I had to test all my assertions and try with the real parts. The BAS70 are apparently not practical for a prototype because I have no suitable PCB. I&apos;d have to put a lot of wires... But I found a method with the legs of two 1N4148 ! It was a pretty crazy adventure but it ends well (so far, if you don&apos;t count the 30 capacitors I soldered in reverse). The positive side is connected to the diodes with a solder bridge and the other stands alone, waiting to be bent. yann, are you still planning to connect this according to your earlier drawing https://hackaday.io/project/18757-ygrec16-ygs-16bits-relay-electric-computer/log/56214-new-dram-array ? For accessing a row, you will need separate relay contacts for charge and discharge, as in the original Rory Mangles design. In your earlier drawing, each capacitor has 2 diodes, but for each charge diode, there is a current path in the other direction (through the discharge diode, then to the left side, through the two series diodes reaching the charge line. So each charge/discharge diode is shorted in the other direction through three diodes in series. Unless your working voltage is lower than 3 diode voltage drops (seems unlikely), this will not work. And I have chosen a high voltage system (24V as indicated on the drawing) to increase the stored charge, hence the retention duration and the tripping of the sense coils. The two diodes in series in the current path (I don&apos;t see how you find 3?) should not have a significant influence. Of course... It&apos;s not yet tested. Can you clarify your concerns ? Make a drawing ? The "red" diode is supposed to be "non conducting". But will that work, if the current can follow the green path to the other end of the "red" diode ? The same story goes for all other diodes connected to a capacitor. For current to pass, there must be a potential difference. Only one column is connected to 0V at a time, so this limits the will of the electrons to flow somewhere else. I hope this can convice you ? I think I start to see what you mean... I&apos;ll have to investigate. How many relays will your DRAM use? Basicly the relays are for MUXes and sending the pulses and data. In practice, I have to test a theory with the prototype : we can drive several lines at once. This way, the column MUX can be shared with all the bitplane, driving the relative bitcost down to maybe 18 relays/bit. If the column drivers can be shared then I can reduce the number of line MUXs, down to maybe 8 and save even more. 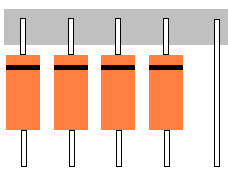 The column MUX would grow from 32 to 64. But leakage could become a problem. I must check before assembling so many parts ! There might be an alternate to the wiring madness. I made a diode array in SIP - similar to those resistor networks for pull ups/down to a common rail. What I have is a strip of FR4 copper clad as the common on which one end of the diodes are soldered to while leave the other end open. You can populate the opposite side of the FR4 for the other bus too i.e. make a dual row version. :) Pretty useful for protection networks for homebrew circuits as it reduces the crossing of tracks on your main PCB while actually improving on the performance - lower inductance. In the definitive DRAM, both diodes will be packed in a single SOT23 part. For now, I will soon be ready to estimate the necessary refresh rate. Routing those would still be a pain as you have 2 busses that are running across signals at 90 degrees basically needs 2 layers. The SIP idea basically gets you another couple of routing layers for the rails. What bothers me most is how to test them. I might order some relays and make one myself! I think it would help me understand your design so I can make DRAM with TTL better. or an intel 2114 XD, Nah, Caps diods and relays are a bit special. I actually might use DRAM for the Registers on my #SBP-CPU (Slice Based Processor) project because I cant find the logic chips I need. It might actually work! Btw, excited to see how this works.